I am impelled to speak up! ‘Scent of Roses’ from ‘The Prophecies Book of Truth’ website has a new post, in which she/he declares that she/he has been deceived and that MDM’s prophecies are false. This person obviously doesn’t realize that prophecies are completed in God’s time – that a few months to God could be years for us. And there is the human factor in misreading/misunderstanding the prophecies ; lack of patience, pride, etc. Also that prayers can delay things. Imagine if we said that because Fatima’s prophecies have not yet come true, they are false… etc. Besides, all these things have been foretold by the saints through the ages, such as St Francis, Bl Anne Catherine Emmerich, Pope St. Pius X, Ven Abp. Fulton Sheen, Padre Pio, St Faustina, ..) and by Our lady herself at Quito, La Salette, Fatima, Akita, (these are “officially” recognized ones) as well as Garabandal, Medjugorje etc. How can these prophecies – some of them hundreds of years apart, at a time when there was not the access to information as there is today – be a co-incidence? They are in the Bible both O.T & NT: and the Catechism of the Catholic Church. Scent of Roses claims that “She (MDM) even deleted her website after her prophecies were proven to be false. I now realize. All her prophecies lead to nothing. God is not the author of lies and confusion”. Scent of Roses has it all wrong: MDM’s work was done. She had completed what God required of her. She was not supposed to be the focus. In deleting her website, the focus is on The Book of Truth – that is what is important. And now, there are (probably) hundreds of sites with the messages. If one site goes down, there will be another. God knows what He is doing!!! Her prophecies are not new – they were all there – but now they are more well-known. No-one can have an excuse that they did not know – that they did not have time to prepare . The world ignored Fatima’s message; then they ignored Garabandal… God doesn’t give up on us. “All her prophecies lead to nothing”??? I am speechless!!! If one’s whole focus is on whether and when the prophecies come true – we are on the wrong track. These messages should be bringing us back to the Truths of our Faith; to fight for the Truth when it is being slowly obliterated; to be alert to the rot that has set in – and this is OBVIOUS!!!! How can we ignore what is happening?? These messages have changed many lives. The amount of prayer groups and people around the world praying is miraculous. This can only be due to the Holy Spirit. The evil one does not ask people to pray, especially to our blessed Mother who is his arch enemy. God is definitely not the author of lies and confusion. The Truth in the messages is verified by other accounts and prophecies through the ages (as stated previously). The lies come from a cunning and ruthless enemy who is desperate and is the expert at “confusion”. We need more Faith; we need more patience; we need to pray more that we can be faithful. Remember this is a TEST. We have to persevere to the end. Many people are losing heart, and some Crusaders are losing their original fervour. They are “tired” of waiting”. We find it difficult to wait, but we have to be submissive to God’s Will and FIGHT for Him. We are His Hands, His feet, His warriors. We are important. Our Mission is vital. Please don’t give up! We need to inspire each other. We need to support and encourage each other in our prayer groups. We need to be like the early Christians – like family. How can anyone be bored with waiting? Our prayer group has had many challenges along the way – personally and with others in the Church Community. We stay together, we pray for each other, we send each other urgent messages for Divine Help; we pray together, we plan (little) tactics for world events and incorporate them into our local Church communities. In this way, we are assured of help and support and we stay strong. The crusade prayers are very important. There are prayers for when you begin to doubt. Say them every day, especially when you are vulnerable. Pray Litany Prayer 3; Crusade Prayers 51, 74, 86, 92. Stay away from people who “poison” you with their negative opinions. Instead, form close bonds with believers. Finally, please pray for “Scent of Roses” and for all those who are not sure, for those who are being confused, for those tired of waiting. Now is not the time to quit. We are just getting started! the church Militant here on earth. We have had so many graces. If it were a catechetical error I’d understand her concern, but simply over some minor “not yet” fulfilled prophecy? Her faith was weak and she was without support when she was attacked by the evil one probably through well- meaning people. This is why all Crusaders must get into groups now! To be sheltered! The following post was emailed to me on 19 August 2016. Note: the post is not on the site now. Obviously Scent of Roses has left the site, but all the other posts are there (except hers). I hereby wish to declare that I no longer wish to have anything to do with the seer calling herself ‘Maria divine mercy’ or her prophecies. No more messages will appear on this site as I am now convinced that these messages are in fact false. I apologize for spreading her content and would like to advise to stay away from anything to do with the “seer” in the future. Souls are at stake and I believe the Irish lady to be a false prophet. Please disregard all previous content and or e-mails. Please destroy all digital and or physical copies coming from this website if possible. I hereby acknowledge all ecclesial authority and wish to express that I am truly sorry for basically assisting a false prophet. I acknowledge that MDM and her supporters are a religious sect. The Rosary and praying for discernment made me realize. I thank God it did. Please be careful looking up other prophets as well. Curiosity and spiritual jealousy or spiritual pride are not something to you want to be looking for. I regret that I was mislead by the other author on this site. All content of mine will, as a result thereof, be deleted. Thanks for understanding. Remember failed prophecies are failed prophecies, no matter how hard you try to reinterpret them. “MDM” prophesied many lies. She even deleted her website after her prophecies were proven to be false. I now realize. All her prophecies lead to nothing. God is not the author of lies and confusion. 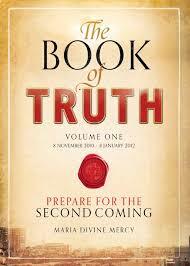 Please consider staying away from the “book of truth” and its contents. Previous Previous post: The Bishop of Brisbane joins the throng!